Unless you're the one that's been living underground in a bunker, you'll probably know that Far Cry New Dawn just arrived. While its colourful take on the apocalypse is great, and offers innovations on the classic Far Cry formula – as you can read all about in our Far Cry New Dawn review – it really, really, hates dogs. Now, in a day and age where #dogsofinstagram rule like kings, it seems like an odd choice to go hard on the hating dogs train. But, here we are. "How could anyone hate dogs?" I hear you cry. Trust me, I know, I literally go dog spotting most weekends, but it's true. Far Cry New Dawn hates dogs, and let me tell you exactly how that manifests itself throughout the game. That means you actually rescue Timber from the butcher's block. He's trapped, along with several other furry pals, in a cage waiting to be chopped up and served for lunch. You actually have to wade through the bodies of dead dogs to even get to him. It forces you to hear that heartbreaking sound of a dog crying out in pain as it breathes its last breath. As a dog lover and a vegetarian, it certainly wasn't my best memory of playing through Far Cry New Dawn. 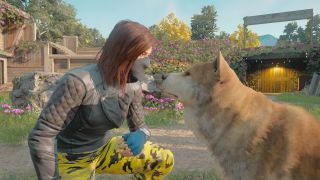 But Far Cry New Dawn isn't done with the dog hate yet. In fact, it only gets worse from here. The Highwaymen, the delights that they are, think so little of dogs that they not only eat them but they also turn them into weapons. No, not some monstrosity like that guy who turned his dead cat into a drone, and then started a whole taxidermy drone company. But, somehow, it's worse. Working your way through the various outposts in Far Cry New Dawn, once you start trying to tackle any of them at tier 3 – the highest possible in the game – you'll start hearing a rather intense beeping. Now usually that might suggest you're dangerously close to a proximity mine, but no. I'll just leave that there for a second. What you think are adorable little doggos coming around the corner are actually guard dogs with tiny little C4 bomb jackets on. That beeping is the countdown to them literally exploding. What did the dogs ever do to you Ubisoft? A little later on in the story there's also a mission where you're literally forced to engage in even more dog cruelty. A man called Irwin Smalls send you off on a mission entitled "Now That's Entertainment", which might sound like fun, but actually involves you being stripped of your weapons, and sent into an arena where you must fight to the death with your fists or any kind of melee weapon that you can find lying around. And the first wave of enemies, yes, you guessed it: Dogs. You literally have to punch and kick, and later beat with a stick, dogs to death in order to progress. Someone call the post-apocalyptic PETA. That's not even talking about the wild dogs that will regularly attack you as you patrol Hope County, that you'll probably have to skin and trade in for essential crafting resources. The dog sadness is relentless. Whatever Far Cry New Dawn says, they're all still the best boys. Yes, even the ones I had to kill. Far Cry New Dawn is out now on PS4, Xbox One and PC so you can experience the horror for yourself.